In 2018, the growing problem of ocean plastics and China’s imported waste ban both demanded thoughtful deliberation and action, and local communities and businesses found creative ways to solve their waste management challenges. So, without further ado, here are five trends that shaped waste management this past year. In most municipalities residents pay for waste collection and disposal through their property taxes or a fixed fee. This results in an odd situation where a household putting out one bag of trash is charged the same as another putting out 10. With PAYT, also known variously as trash metering, unit pricing, variable rate pricing, or simply, user pay, residents who use more pay more. In some PAYT municipalities households pre-purchase bag tags, while in others, households are charged more or less based on bin size. The theory behind this bit of social engineering is that residents in PAYT municipalities are incentivized to reduce their waste generation, thereby diverting waste from landfills. There are currently 4,000 cities in the U.S. with PAYT programs and 200 in Canada. It’s been around for a long time but is experiencing renewed interest due to its promise to reduce waste and increase participation in municipal organics and recycling programs. Saskatoon, Canada is working on implementing PAYT in 2020. The city estimates that the combination of PAYT and an organics program will extend the life of its landfill by 23 years, saving taxpayers about $5 million CAD annually. Each year, the construction, renovation and demolition industries generate an estimated 250-million tons of waste materials in the U.S. More than half of that waste finds its way into landfills, a figure that makes up a large portion of the total waste stream. The core mission of the Finger Lakes ReUse Center in Ithaca, New York is to identify suitable buildings for safe, economical deconstruction by hand. Collected materials are processed, sorted and packaged, then made available for sale. By deconstructing rather than demolishing buildings, the ReUse Centre is able to divert between 70 and 90 per cent of building materials from landfills. The Great Pacific Garbage Patch is a swirling vortex of plastic the size of France that floats between Hawaii and California. Millions of tonnes of single-use plastics, such as water-bottles, straws, shopping bags, stir sticks, and the like, annually enter the world’s oceans from rivers and shorelines; per a recent study by The Ocean Cleanup, an organization that uses technology to remove plastic from the ocean, these sources of microplastic make up 94 per cent of the patch’s estimated 1.8 trillion plastic pieces. Though this mishmash of single-use plastics makes up most of the pieces in the patch, 46 per cent of its total mass by weight is made up of just one kind of waste—fishing nets from commercial vessels. Plastic-based fishing line is designed for durability, meaning that once it’s dumped at sea it can pose an entangling threat to marine life for hundreds of years. And once plastic degrades into microplastic it can be swallowed by fish and make its way up the food chain. So, what’s being done about this ocean-sized problem? Researchers are working on developing and commercializing fishing line that biodegrades at much faster rates and the UN is developing measures to see that all fishing gear is marked, so that lost or discarded equipment can be traced back to its owner. 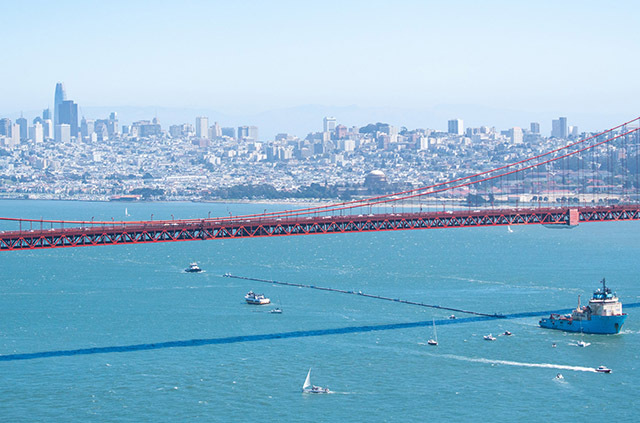 The Ocean Cleanup is developing a floating system that traps and captures plastic without corralling fish. 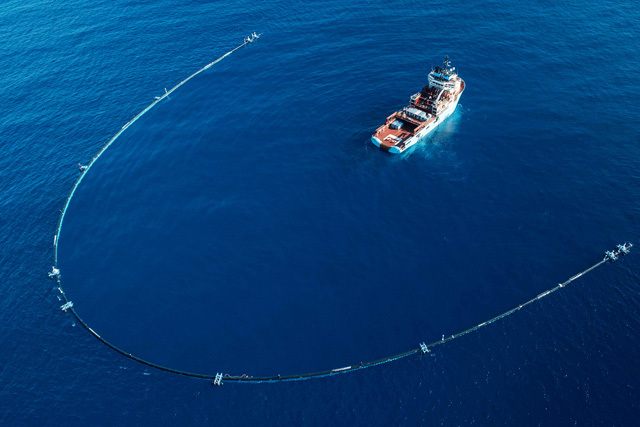 Its first cleaning system was recently deployed at the Great Pacific Garbage Patch. On November 20, 2018, the organization’s 24-year-old founder and CEO, Boyan Slat, reported that plastics were entering the system but were also sometimes leaving it, and that engineers were examining the data to find out why. Slat’s organization estimates that the system, when and if it’s fully deployed, could clean up 50 per cent of the patch in just five years. Their ultimate goal is to remove 90 per cent of ocean plastic by 2040. In 2016, China imported two-thirds of the world’s plastic waste. Just two years later, on Jan. 1, 2018, China banned 24 types of waste (including plastics) from import. 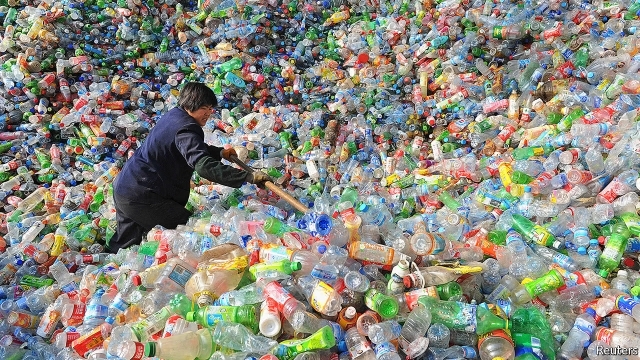 With one fell swoop Western countries were left holding the bag, so-to-speak: Without the facilities to cope with the tremendous quantities of plastic rubbish once offshored to China, much of the West’s recyclable plastic is now making its way into its landfills. Many environmentalists cheered on China’s decision as a big step toward a greener future. They claimed the ban would not only improve China’s environment, it would force Westerners to abandon their ‘out of sight, out of mind’ mentality towards waste and better manage their waste streams. Following China’s decision to ban recycling imports, the EU released its new strategy for dealing with plastics. The report found that of the 25.8 million tonnes of plastic waste generated in Europe every year, less than 30 per cent is collected for recycling, much of which is offshored for treatment. Plastic packaging used on the continent to be reusable or easily recycled. EU plastic production modernized and recycling capacity significantly increased and modernized. The phasing out of the export of poorly sorted plastic waste. An investment of €350-million EUR in plastics production research. Europeans aren’t the only ones being forced to rethink their approach to recycling. In the coming years, it’ll be interesting to watch how affected jurisdictions around the globe respond. As smart technology continues to permeate the business world, another industry that the Internet of Things (IoT) is modernizing is waste management. In 2018, large organizations like Target, Brookfield, Lowe’s, Walmart, and Cadillac Fairview relied on Sensa’s innovative IoT-based technology, including remote fullness monitoring, diagnostics and insights reporting to meet their objectives. By providing our customers with an intuitive, yet powerful system to automate the scheduling of waste pick-ups and purchase orders, and track equipment and system performance, our technologies eliminate the cost of unnecessary collections, lower organizations’ operational costs and reduce their carbon footprints. Get in touch with us today to find out how we can help improve your waste management practice. “Global Waste Management Outlook,” United Nations Environment Programme. “Does Pay As You Throw Pay Off?” Waste360 Magazine. “Biodegradable fishing gear: part of the solution to ghost fishing and marine pollution,” Animal Conservation, 2016 The Zoological Society of London. “Towards Voluntary Guidelines on marking fishing gear,” The Blue Growth Blog, Food and Agriculture Organization of the United Nations (FAO). “A European Strategy for Plastics in a Circular Economy,” European Commission, 2018.